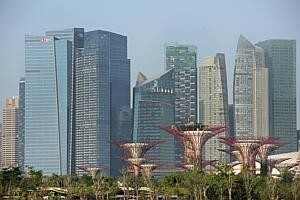 Singapore is counting on South-east Asia's economic boom to lure investment as the island's clampdown on foreign labour raises wage costs and makes it difficult for companies to fill positions. A plan by South-east Asian nations for a common market through the removal of tariffs and trade barriers for goods and services by 2015 will boost the bloc's appeal as a production base, Economic Development Board chairman Leo Yip said in a Bloomberg Television interview with Haslinda Amin. Singapore is poised to benefit as companies expanding in the region set up headquarters and research facilities here even as they build factories elsewhere, he said. Singapore became South-east Asia's only advanced economy by moving up the technology ladder, turning a trading port into the region's biggest banking centre and a manufacturer of electronics, petrochemicals and pharmaceuticals. As its bigger, less-developed neighbours lure companies with faster growth rates, larger populations and cheaper workers, the island is forced to find new ways to position itself to stay competitive. "Singapore is not a low-cost location," Mr Yip said. "Companies understand that but companies come here because they see Singapore as a place where they can harness business growth." Most of South- east Asia's 600 million people - about the combined population of the US, Germany and Brazil - will be middle class by 2020, and that will boost demand for goods and services, according to Bain & Co. The region, known as the Association of South-east Asian Nations or Asean, is forecast to grow 5.2 per cent this year and 5.6 per cent in 2014, according to the Asian Development Bank. "Indonesia has been growing nicely over the last few years, and Philippines in the last couple of years," Mr Yip said. After investing in China and India in recent years, some global companies "have realised that they perhaps have not paid the attention that they need to in Asean", he said. The Philippines is poised to be among the five fastest-growing economies globally in 2013 and 2014, according to Bloomberg surveys. In Indonesia, the world's fourth most-populous nation, quarterly growth has averaged about 6.3 per cent since the start of 2010. "Singapore aims to be the New York of Asean," said Joey Chew, an economist at Barclays Plc in the city-state. "If the rest of Asean does well, naturally there's a complementary effect for Singapore." While the economy grew at the slowest pace in three years in 2012, Singapore attracted fixed-asset investments of about S$16 billion. Mr Yip said it's on track to meet the 2013 target of S$13 billion in commitments. The city overtook Japan as Asia's biggest foreign-exchange centre for the first time as trading surged in the past three years. Manufacturing will continue to play a "very valuable role" in Singapore, Mr Yip said, as the island-nation ventures into new industries including space technology. The government this year set up an Office for Space Technology and Industry as it seeks a share of the US$290 billion global space market. The 48-year-old nation is also adjusting to an ageing population and a tighter labour supply. An influx of immigrants has made citizens unhappy. The government is tightening curbs on overseas workers for a fourth straight year as it steps up efforts to help companies increase productivity. Foreign employment growth slowed in the first half of 2013 from a year earlier and the labour market will remain tight for the rest of 2013, the Ministry of Manpower said last week. "Some companies do tell us that the adjustment is challenging, and we understand that," Mr Yip said. "For some of them, they may even have to decide that the way that their business is conducted, maybe is no longer tenable to do it in Singapore." That's where the rest of the region comes in. Businesses looking for a "production footprint" in South-east Asia will also start to see its economies as points on a supply chain rather than looking for a single country to carry out all operations, Mr Yip said. "Singapore cannot afford to attract the same kind of land and labour-intensive industries that we did in the past," said Michael Wan, an economist at Credit Suisse Group AG in Singapore. "If you think of Singapore as a services hub, it still has many advantages." Officials from the 10-member Asean are working to allow free movement of goods, services, investment, capital and skilled labour as part of a European Union-style integration plan, without the common currency. The Asean Economic Community is targeted for the end of 2015. Asia - which had seven of the top 10 exporters of textiles and clothing and office and telecommunications equipment in 2011 - shipped US$5.98 trillion of goods that year, an 18 per cent increase from the year before, according to the World Trade Organization. Of that, South-east Asia sent out US$1.24 trillion of products, compared with US$432 billion in 2000 and US$72 billion in 1980, data from the WTO show.